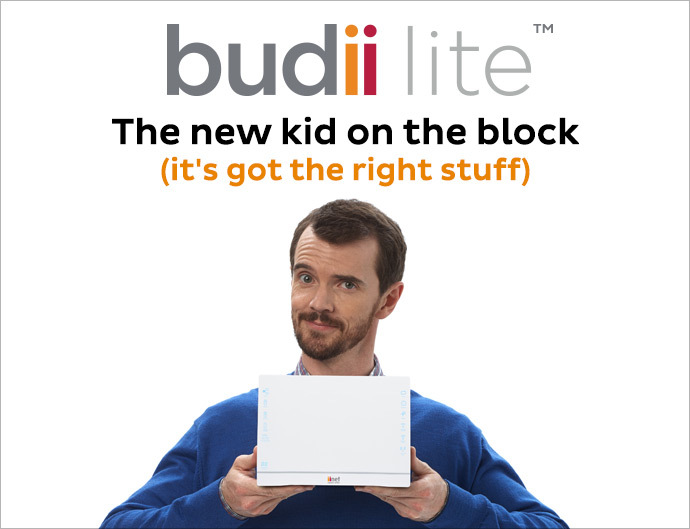 Budii Lite is iiNet’s brand-spanking new modem and he’s ready to come home and help your household enjoy all the benefits the Internet has to offer. This modem is not only packed with the latest technology, but is easier than ever to use. And, comes at a great price! We’ve delivered that, and more! Check out the awesome features of Budii Lite here. We want Budii Lite to work for every customer with a minimum of fuss, right from day one. That’s why we’ve spent the last four months testing Budii Lite over every type of connection and set-up imaginable. 200 staff and customers have sorted out any teething problems, so you don’t have to. Whatever the network you access, we have you covered. Budii Lite will allow connection over ADSL2+, VDSL2 or even the NBN! You know what it’s like. It’s the early evening and everyone arrives home from work or school, sometimes bringing a friend or two for dinner. And then everyone jumps straight on to the home network! But with Budii Lite, everyone can connect their mobile phone or tablet to the Internet at the same time via dual band Wi-Fi and still enjoy a reliable connection without buffering. We’ve included 802.11ac Wi-Fi because it’s the latest wireless technology and we believe more and more devices will be able to connect using this technology in the future. We have also kept the more traditional 802.11n Wi-Fi because that will be around for a while too. What’s the difference between the two? 802.11ac is great for bandwidth hungry media and is a lot quicker to boot. 802.11n is still great for surfing the web and all things social. The range of 802.11ac technology is not as great as 802.11n, but if you do want to optimise the range of 802.11ac in Budii Lite then you can always use the optional external antennas supplied in the box. If you want to learn more about Wi-Fi coverage check out this great article by Adam Turner first published in Gadgets On The Go. Want the fastest speeds possible for multiple people at the same time? (Yes, gamers, we’re looking at you). Budii Lite has 4 Gigabit LAN ports for your Ethernet devices and we’ve also included a Gigabit WAN port. So when those precious milliseconds are all that stands between you and a 14 year old gamer in Sweden, Budii Lite has got your back. With an integrated Voice over IP support, you can use Budii Lite to talk to your friends and family via Netphone – simply plug in your existing home phone! iiTalk is iiNet’s Netphone phone plan which is included with Naked DSL internet connection. It includes all your local and national landline calls at no extra cost, and offers great rates on international dialing. More good news! Budii Lite is available outright for $129 and when you sign up on a 24-month contract it will cost you just $99. To welcome a Budii Lite into your home, just head over to the iiNet website. So, what about the original Budii? Built in video bridge, perfect for Fetch TV customers. One 3.5mm audio jack to allow direct streaming to a set of connected speakers or external amp. A backup battery for customers who rely on their home phone – even in blackouts. Visit our website for more information on our powerful Budii modem. Simon Watt is in the iiNet Labs team and is too mysterious to talk about. Is it available for the people who were with aapt? Considering I’m having such issues with our current modem maybe its time for a change.. Sorry, forgot to mention, if you only use 802.11n but in the 5GHz band you can also see the Budii Lite 802.11ac network, but in order to take advantage of the faster speeds of 802.11ac you’ll need to have true 802.11ac on the client connected to the modem. excellent wireless signal support 2.4G & 5G. Provides stronger, clearer and faster Wi-Fi. @Jamen Porteus, I totally agree with you Jamen, the BOB2 is total crap. We have had nothing but trouble with ours. @Wendy Horne, I have had trouble with mine too. Couldn’t agree more Jamen. BOB2 just doesn’t work with VOIP. I agree with Jamen, where is the accompanying phone? The blurb says “Includes all the great features of BoB Lite and BoB2”- seems a phone was not one of these “great features”. It also does not appear to be wall mountable, whereas Bob2 was. @Jamen Porteus, Yeah it would be great if IInet would offer a modem with handset to replace the BOB2. Those of us who bought the BOB2 should be given a free replacement or a massive discount. Yes, we have had four Bob2 modems and two handsets. Currently, it is working, but the speeds vary greatly at different times, sometimes the speed is so bad it is impossible to access any internet sites, without a modem reboot. Very wary of upgrading to any new modem / handset. Have to say IINET support have always been very helpful. I note Buddi and Buddi Lite both provide network attached storage (NAS) through a USB port. Is it USB2 or USB3? Is it possible to simultaneously run a network attached printer (NAP)? Although you call Buddi the flagship, is it inferior to Buddi lite insofar as not having “ac” WIFI? If so, is an upgraded Buddi in the pipeline? Can you compare Buddi with Buddi Lite in their ability to run normal phone line as well as VOIP? There are no great features with Bob 2. I hope when we switch to NBN you will have a better alternative. I agree Bob2 was a waste of time and money. I am glad that I was not the only one to dump it. Richard Pike. I think I just register for NBN when it comes to my area, but I am not sure as the page I was on jumped to another page ,or to another registration application. Please let me know if my registration was successful or not. Why didn’t you tell me about this modem a few weeks ago when I had to get a new modem?You sold me the bob lite? How does this unit compare with my TP-LINK N500? Will I improve things by buying the Budi? agree with the last contributor. Never been happy with BOB2 appliance and more in particular the phone piece which is the 2nd one sent to me. The Bob phones simply don’t work, I asked for a new one, it doesn’t work either. Does Bundii Lite work with VOIP? If so, can my Bob2 VOIP handset phone be connected to the Bindii Lite? 2 hand pieces with BOB2 and even the last one I ‘m not happy with. Bring on an improvement. I’m keen to give it a go, but I would like some guarantees. I’m paying $10 a month for a bob2 that has constant issues, and I’m seriously over calling you guys and spending literally hours on the phone to try and rectify them. If you’re prepared to provide a satisfaction warranty, I’m prepared to purchase and give it a try. How much is the separate phone for Bud ii ? Agree the Bob 2 modem is great but hand set and answer machine lets it down badly.. Now on our second hand set and it is faulty now as well with buttons continuing to stick. Now seriously considering my options as I like VOIP but hand set lets it down. Do you recycle the old boblite modem? If not, would you consider it? Excellent news. This is a great move from iinet offering cost effective yet powerful new Modem Budii Lite. This will give many customer an opportunity to upgrade their existing modem hardware after long time. Appreciate it. Keep up the good work iinet. As an existing customer with fetchTv,over three years, and a shareholder,(who pays in advance for inferior equipment and poor service; Check my closed Tasks) and who has been ignored and treated abysmally by the iinett Team; Do I qualify for a discount or a trade-in of MY present installation? Maybe this comment will attract some response. No choice for those on a Combo Plan (which incorporates a rented Bob2) apart of course from buying a Budii outright. But then, if I’m not mistaken, there would be no VoIP facility! The words ‘get your act into gear” come to mind. I have been a customer of iiNet and FetchTv for three years, and still am. Prior to becoming their customer, vodafone was my principal internet provider. As I have bitterly learnt, this is an example of ‘Out of the frying pan, into the fire’. I am also a shareholder in iiNet, not that this attracts special treatment from these companies. As with all customers, I pay in advance for sub standard, obsolescent equipment, with inconsistent and inadequate performance and abysmal service from the iiNet Team members of all staff levels; Four staff members are an exception to this appropriate description. See CSRs, I do keep my promises. You pay for the service call, hope that the automated queing process does not disconnect your call, eventually one speaks to a human, one always receives a polite hearing on intimate terms, may, but usually not, on the first or many follow ups calls, receive a litany of hollow promises; A satisfactory resolution for the customer is a vain expectation. You may accept an offer of allowing ‘Remote access to your computer and modem’ by an iiNet technical expert. I did, but you definitely DO NOT. telephone all failed to be revived by his ‘Kiss of life’. Ten days later, some normality of internet/VOIP was returned, namely sub standard. Was I inconvenienced, you betcha; And still am; But I am tenacious and made of stern stuff. Was anyone concerned by this incident? I was. iiNet was not. featured in iiNet blurb/ad/blog/boast ‘Introducing the new kid on the block: Budii Lite as “ X is in the iiNet Labs Team and is too mysterious to talk about”. Myself, I have no doubt as to why iinet is reluctant to talk. But wait, there’s more; Could iiNet have introduced another phantom such as Ms. Chelsea Gray, Customer Experience Officer who graciously invites feedback via a short survey on your current transaction with the CSR (Customer Service Representative)? Don’t just accept this comment, I am agreeable to publish or Email forty pages of ‘Tasks’ which have been ‘Closed Off, and Returned to My Tasks’ all of which the Team member may arbitrarily apply, without customer contact to ascertain if the victim/customer is satisfied. The Team member can confidently ‘Closed Off – Task’ even if a promise has been made to the customer that the problem ‘Has been Tasked to another section or Team member’ OR ‘Has been escalated to – my supervisor/manager in /Auckland/Sydney/Adelaide/ Perth/Cape Town/head office/Customer Complaint Resolution Centre. Warning! Do not hold your breath in the interim as you will suffocate. You can telephone, send Emails (but first one has to discover the iinet Secret Email address procedure), send snail mail, most of which will be allotted a ‘Task number’ all of which will treated equally; They will be ignored, receive no response, no reply, thrown into a waste bin (actual or digital), and may even bring a laugh in the staff tea room. I own the internet modem and its auxiliary equipment and the FetchTV set top box supplied by iiNet and FetchTV; I am now being further frustrated by the fifth ( 5th ) replacement set top box which does not function effectively and gives all indications of initiating spontaneous combustion. The prospect of being incinerated by iiNet’s infernal machines is a distinct possibility. Should such an event occur then my medical team, executors, beneficiaries, and particularly my creditors, have indicated they will push for a coronial inquest seeking a verdict of ‘Death by iiNet’. Do you suspect that I have a grudge with iiNet? Yes, dear readers, I think that I have ample reasons. Oh; Did I mention that I am a Seventy-three year person, afflicted with chronic illnesses, (known to iiNet ‘Team members’), living independently without support, a living legend with aspirations to become a national living treasure. Now I know what the axiom ‘Caveat emptor’ means. bob2 falls down with a recorded message that cannot be individualized…when the power goes off, or I forget to turn the machine on, messages go through, but to where??? presumably to Telstra as they own the lines, but why can I not retrieve them somehow,…the handset is slippery and too easy to drop. Are you interested in joining a group for a legal class action against iiNet?